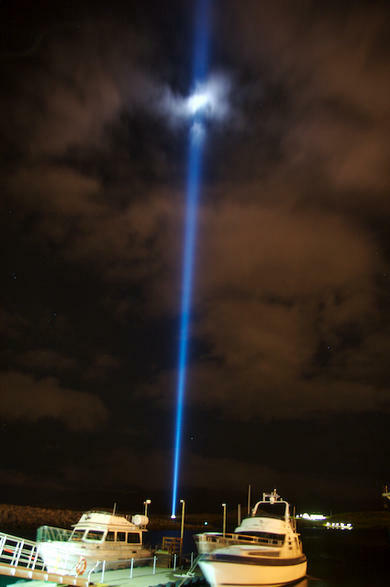 Web of Science: How far into the sky does the light from Yoko Ono's Peace Tower travel? The short answer is that there is no particular limit to the distance it travels. If we were out in space and inside the ray of light, and there were no clouds between us and the light source, we could see it, either with the naked eye or with the appropriate equipment. With sufficiently good equipment, we would be able to "see" or detect the light quite far out in space. The distance at which it is detectable depends on the quality of the equipment used, and increases as it gets better. Seen from the outside, the light column fades in proportion to altitude while it penetrates the atmosphere. This is because the light itself is attenuated, while the column widens and the air gets thinner. The light mostly fades due to scattering, but also due to absorption by particles in the atmosphere. The column also spreads over a greater surface area the further up it goes, so the proportion of light to surface area decreases with altitude. This is just as much the case in the vacuum of space as it is within the Earth's atmosphere. If we stand outside the light column, we do not see the white light emitted directly by the light source. We only see signs of it, and we interpret these signs as a column. They reach us as photons (light particles) that scatter from the column and subsequently hit our eyes. Particles in the air scatter the light and thus become visible. The particle density falls with increased altitude in the atmosphere, and signs of the light in the column are reduced. The effects are still visible at 100 km altitude, where the density of the atmosphere is less than a millionth of that at the surface of the Earth. We might say the light column ceases to be visible from the outside at approximately this height, if it hasn't already been obscured by clouds. In the picture, it is clear that the light source is emitting white light. The lowest part of the light column, however, has a blue texture due to Rayleigh distribution, while at higher altitudes the column passes through layers containing larger particles, which gives off a more white texture because of Mie distribution. When the ray hits a cloud, the light particles scatter throughout the air and are reflected back to us from a larger area. However, the cloud in this picture doesn't block the light in the column significantly, and so the blue column continues above the cloud. Outside the atmosphere, there are no molecules to scatter the light, and the light column is therefore not visible from outside in the way described here. However, from a satellite within the column itself, the light source in Viðey can be seen clearly, much like any other light source. The strength of the light depends on the distance and on the clouds in the atmosphere. From the ground, on a clear winter night, we can see signs of the Peace Tower with the naked eye up to a height determined by the intensity of visible light in our environment. Astronomical observers call this lighting "light pollution." Light travels into the atmosphere and is scattered back down to us. It overwhelms the light from Viðey at a certain height, depending on the circumstances at any given time. Rayleigh scattering is named after the English physicist Lord Rayleigh (1842-1919). It is caused by particles or uneven density in particles (pressure variations) smaller than the wavelength of light. The wavelength of visible light is between 400 and 700 nm (nm, nanometer is 10-9 m or one billionth of a meter). Rayleigh scattering is highly dependent on wavelength, and is 10 times stronger for blue light than for red. It gives the sky its blue colour despite the fact that sunlight is white. In the same way, it gives the Peace Tower its blue texture where the air is clear, although the original light source is white, as can be seen in the picture. Mie scattering is named after the German physicist Gustav Mie (1869-1957). It is caused by particles that are much larger than a wavelength in diameter. Its strength is independent of wavelength and it therefore has a white texture. Tiny drops of water, small ice crystals (clouds and fog) and dust particles create Mie scattering, as can be seen from the white cloud and its surroundings in the picture. The difference between these two types of scattering is clearly evident in the Peace Tower, and can be seen quite well in the picture. The lowest part of the Peace Tower passes through clear air and acquires a blue hue although the light source is white, while the column becomes whiter at a higher altitude due to Mie scattering. It finally reaches the clouds, and passes through dense drops of water or ice crystals. Photons are then repeatedly reflected by drops of water before reaching the camera. At the same time, the area emitting light becomes larger. The photograph of the Peace Tower was taken by Jón Reykdal at the request of the Icelandic Web of Science and we express our gratitude to him. More photos of the Peace Tower can be viewed here © Jón Reykdal. Ari Ólafsson. „How far into the sky does the light from Yoko Ono's Peace Tower travel?“. The Icelandic Web of Science 30.4.2008. http://why.is/svar.php?id=47440. (Skoðað 21.4.2019).